Defined Contribution plan participants are optimistic about their financial futures, at least in the short term. 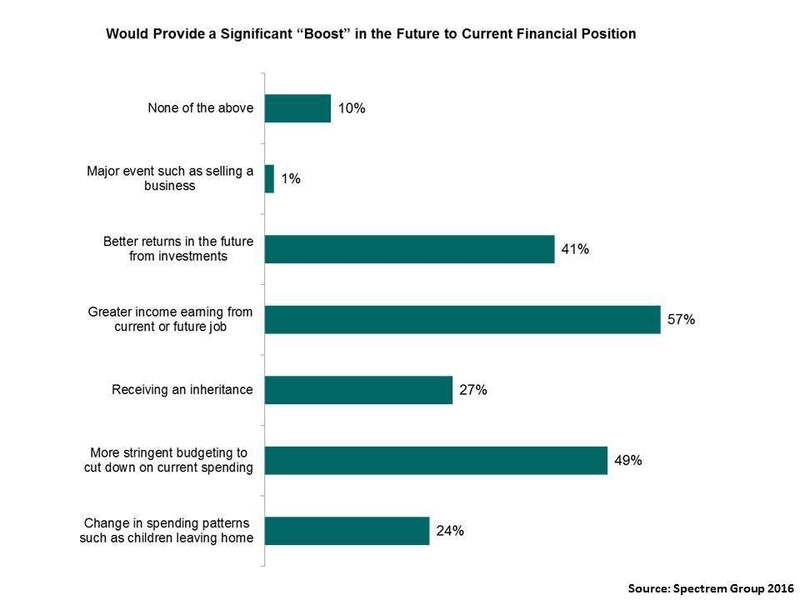 Spectrem Group’s DC Participant Insight Series report, Financial Behaviors and the Investor’s Mindset finds that 68 percent expect their financial situation to be improved a year from now compared to the present. What factors do they anticipate will give a significant boost to their current financial position? The largest percentage (57 percent) anticipate they will see greater income from their current or future job, according to our survey of 1,442.participants in an employer-sponsored retirement savings plan. Roughly half of DC participants expect that more stringent budgeting and cutting down on current spending will prove a boost to their current financial position. Four-in-ten anticipate a boost from better investment returns, while almost three-in-ten are expecting to receive an inheritance. Roughly one-quarter of DC participants expect a change in household status, such as children moving out, will effect a change in spending patterns. It is telling that DC plan participants cite these factors as the ones that will provide them with a significant boost to their budget. They correlate to the factors that they credit as the primary contributors to their success, foremost among them hard work, frugality and smart investing. Analysis by age finds expected generational differences in projections of what will provide the most significant boost to the current financial position of DC plan participants. Millennials and Gen Xers are significantly more likely to be anticipating salary and earnings increases from their jobs than Baby Boomer plan participants. Younger plan participants, too, see the need to focus on their budget and spending more so than do their older cohorts. Conversely, Baby Boomer plan participants are more likely than Millennials and Gen Xers to anticipate earning better investment returns. Between men and women plan participants, women are generally more likely to self-report a lack of confidence in their financial knowledge. So it is surprising that a larger percentage of women plan participants than men reported they expect to receive a boost in their current financial position from higher income at their present or future job, and earning better investment returns. Participants with a plan balance between $350,000-$749,999 were more likely than those with a plan balance of at least $750,000 to anticipate a boost from stricter budgeting and less spending, a raise in salary, and increased investment returns. These findings represent several opportunities for advisors to provide DC plan participants with assistance in key money management areas. Since DC plan participants anticipate the biggest boost to their current financial position from a salary increase, recommend that they increase their contribution. Advisors need to review with individuals how to maximize this extra money in relation to saving for the future. Often employees can increase their contribution when they receive a raise. Younger plan participants are more focused than their older counterparts on budgeting and spending. Discuss financial planning with them. What are their financial goals? What are their expectations? Is their current spending undermining them? Suggest savings strategies with them and set a timetable to review how they are faring with their budget. Less than half of DC plan participants anticipate better investment returns in the future. Advisors need to have a conversation with individuals about their tolerance for risk. Depending on age and plan balance, advisors may want to encourage a more aggressive investment strategy to help them meet their long-term goals.